Come join JLOCC and The League of Women Voters for an evening of non-partisan information on local and state-wide initiatives as we get closer to the November 6 General Election! We’ll bring the libations and bites, you bring your sample ballot, laptop, ballot guide, or at least your thinking cap as we review some ballot measures and races of particular interest to Orange County. Voting can be a daunting task with so many offices and bills to consider – we’ll make it a little easier for you in a digestible way, and who doesn’t love champagne and appetizers?! We will also be hosting a Postage Drive to help support JLOCC’s mission to serve our community and continue our outreach efforts to local and state legislators. Please bring stamps and/or cash donations to help support this pursuit – for example, just $6 allows us to send a letter to each Orange County representative in the State Assembly and State Senate, and $12 allows us to send a letter to each Orange County representative in both Sacramento and Washington D.C., along with each Orange County Supervisor. Please note: Bubbles & Ballots (Thursday) and Brunch & Ballots (Saturday) are sister events. The content and presentation will be the same. As such, PDI points and attendance will only be permitted for one of the two events. 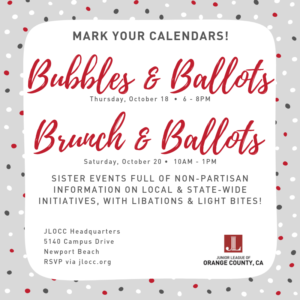 Due to space, food, and printed materials being limited, and as this is a semi-public event, JLOCC members who RSVP to Bubbles & Ballots yet are unable to attend must either cancel their reservation or email advocacy@jlocc.org in order to be eligible to makeup the session at Saturday’s Brunch & Ballots.